To convert a PDF file to text file – launch the application, open the PDF file using Open icon and then click click on Extract Text icon. 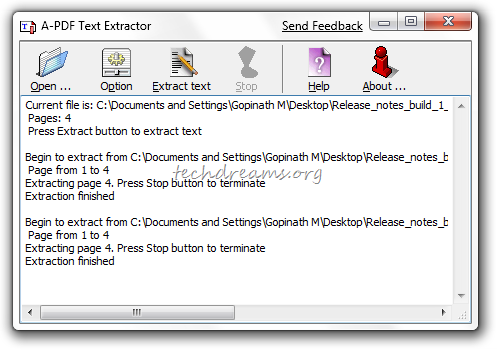 Within few seconds the application will output a plain text file with all the text extracted from the source PDF file. As the output of this application is plain text, it does not preserve any formatting information of source PDF. This utility is a standalone application and does not require Acrobat Reader installation to extract the text. So this application will be the best companion if you want to quickly read the text of a PDF file incase Acrobat Reader is not available.